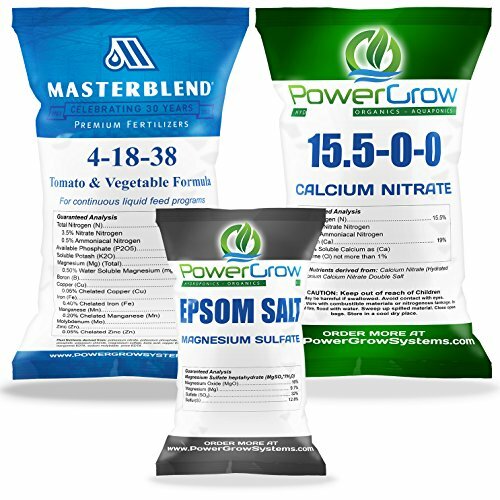 Tired of looking for the individual components (MasterBlend 4-18-38, Calcium Nitrate 15.5-0-0, Epsom Sale (Magnesium Sulfate) for the ultimate MasterBlend fertilizer recipe? Look no further. We have done the work for you. The MasterBlend MASTER KIT, contains all 3 concentrated dry powdered and water soluble components needed for the recommended recipe in the proper amounts, so you can get exactly what you need in one place, without having to pay separate shipping can the hassle of finding the different components on your own. The classic MasterBlend recipe calls for 12g MasterBlend, 12g Calcium Nitrate, and 6g Epsom Salt for 5 gallons of nutrient solution, where each component is mixed into the water individually. (DO NOT BUY KITS THAT ARE PRE-MIXED! Nutrient lockout will occur and will be left as precipitates in your water) We have packed the MasterBlend Master kits in larger quantities to provide you with a better value in a one-stop kit. Available in quanties from 1lb to 75 pounds. Packed in clear bags by PowerGrow Systems (authorized MasterBlend distributor). The 2.5 Pound Kit contains: 1LB MasterBlend, 1LB Calcium Nitrate, 0.5LB Epsom Salt. The 12.5 Pound Kit contains: 5 LBS MasterBLend, 5 LBS Calcium Nitrate, 2.5 LBS Epsom Salt. The 25 Pound Kit contains: 10 LBS MasterBlend, 10 LBS Calcium Nitrate, and 5 LBS Epsom Salt. The 75 Pound Kit contains: 25 LBS MasterBlend, 25 LBS Calcium Nitrate, 14.5 LBS Epsom Salt. If you have any questions about this product by MasterBlend, contact us by completing and submitting the form below. If you are looking for a specif part number, please include it with your message.